Swami Suryananda gives some clear and straightforward guidelines on how to develop devotion, peace of mind and purpose in our lives. This discourse was given during our annual puja to the Vel of Lord Murugan. Download this talk. Divine friends – we are all bhaktas by heart. We all have a deep love of God within us, and this puja is about bringing that deep love of God to the surface. Because there is a battle which runs in every human being’s life. The battle between the higher self and the lower self. The Shakti, the Vel of Murugan, the energy of Shiva is the power that we need to dominate our egocentric nature, our lower nature, so that that bhakta within us can surface and manifest. When I say we all have a deep love of God within us, that’s not just a deep love of God when we come to a temple, or when we’re praying. It’s a deep love of God in our life. A deep love of God in our interactions with our families, with our fellow human beings. With the natural world that surrounds us. Then we’re a true bhakta. What is it that separates us from love? If we just express that love for God when we come to formal ritualised worship, and then allow our lower natures to surface in the rest of our lives, then we’re not a bhakta. Gain the shakti, the power of the Lord so that every moment of your day, every day you are a bhakta. The love that is in each and every one of you can surface, can be dominant, with the shakti, the power of God. Because you are so preoccupied with the world of illusion. You’re so preoccupied with materialism, with money, with those things which are impermanent in your life. The more attachment you have, the more complicated your lives are. The more involvements you have, the more distractions that you have. In today’s world everything is a distraction. Very few people can be with themselves. You all have these smartphones (me included!) I do! I just got one recently, it’s great fun. But it’s a distraction. Because you spend all your time… how many times a day do you check your texts? How many times a day do you check your emails? Do you check your posts on social media, the internet? But we’re never in the now. We’re never in the moment. We’re constantly distracted in our lives. Distracted from ourselves. And when we’re constantly distracted, there’s no space, there’s no time for God. We have to begin to simplify our lives. Making a little bit of time for God in our daily life. So to ignite that lump of coal, we have to make an effort to roll it into the fire. That’s the effort that you’ve made today. 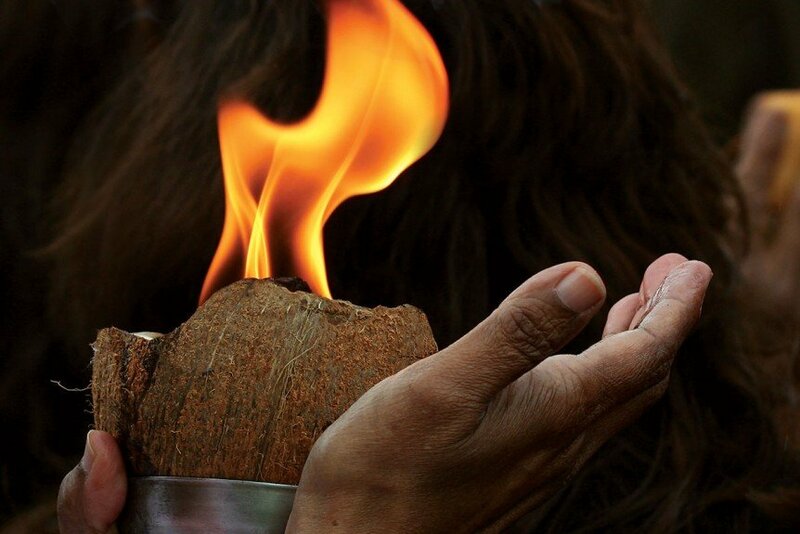 You’ve travelled many, many miles to come on pilgrimage, to roll these lumps of coal into Agni, that fire of the Lord. Lord Murugan is Agni, He is fire. 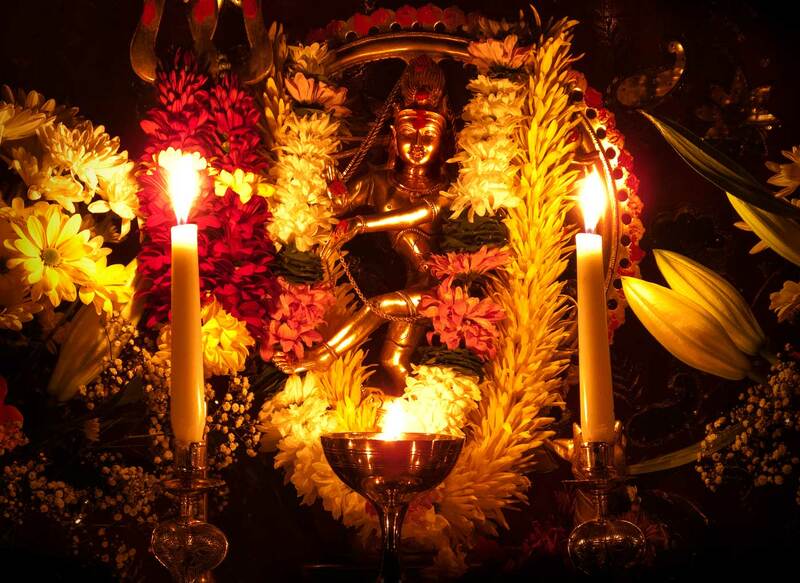 He is Dasa Surya… Lord Shiva dancing in the Universe. His whole diadem is a million billion suns, and that energy, that Agni, that fire is dancing across the whole Universe. And you need to merge your lump of coal into that conflagration. And then there is nothing else, because you are engulfed in the shakti and the power of God. That is Divine experience which you don’t get by reading in a book, you don’t get just because you’re born a Hindu, just because you are a brahmin. It’s of no consequence, unless you practice. Unless you make an effort to roll the lump of coal into the flame – the fire of Divine consciousness. Forget belief… win experience through your own effort. People call themselves Hindus, Buddhists, Christians, Muslims, Jews… but it doesn’t mean anything unless you actually follow and apply yourselves in your life. If you call yourself a Hindu do you identify yourself with Lord Shiva? With the Divine Mother? With Lakshmi, with Durga, with Saraswati, with Murugan, with Krishna? Do you strive to elevate your consciousness into that higher consciousness – to follow dharma, to follow sathyam? Do you educate your children about what these are? What is sathyam? What is absolute truth? Why is important to be truthful? Sathyam is the gateway to jnana, to knowledge. When you experience God, that experience of God, that knowledge of God resonates within you as absolute truth. Absolutely nothing can take that away from you, because it is more real than anything else. Dharma. Each of us has a different dharma in our lives. Some of us are monastics, many of us have families, have responsibilities. We all need to fulfil our dharma and fulfil it with excellence. We need to apply ourselves with excellence in every single thing that we do, for that is God. God isn’t just somebody in a little box which opens when you go to a temple, or a mosque, or a synagogue or a church, once a week, or once a year or whatever. God is omnipresent. Omniscient. When we say God is all powerful, what does that mean? That the awareness of Almighty God is supreme. Every tiny vibration of thought that you have registers with the Divine. Every single impulse that is generated by each and every one of us registers. It’s called cause and effect; Karma. And whilst we are living in this body we are subject to the laws of cause of effect. We need to understand what cause and effect is. If you are with somebody you know well and you have a negative interaction with that person, you lose your temper, you’re frustrated, you’re angry, your whole vibration changes. And it doesn’t end there. It goes on through all of the different interactions that you have that follow that on. Ripples of the consequences of your actions. It doesn’t disappear. It registers in the ether and it becomes your karma. We are responsible for our actions. God has set in motion the law of cause and effect, the law of karma. And yet the compassion and the love of God is immense. And when we surrender, or begin to make an effort to surrender our lives at the lotus feet of the Lord, and identify with God, through the grace of God opportunity will be granted for us to pay off that karma. Opportunities arise for us to use our faculties to serve God in life, in humanity, in each other. For us to begin to express that bhakti within us, that love that dwells within us. Don’t think that you don’t have love. Everybody has love. But people have different ways that they can express that. Different ways that that love is able to manifest and materialise. Be good, do good, and see good. It’s very easy to find fault with another human being. It’s very easy to criticise another human being. Divine friends, don’t do that. Extol the virtue of God in each other. There is always goodness, there is always sweetness, there is always something positive to say about somebody else. Slowly you begin to transform your mindset, your vibration, your awareness that God resides in that other person. That is how you elevate your consciousness, to begin to perceive the Universality of God. This is what Krishna taught in the Gita; to worship God in His Universality. 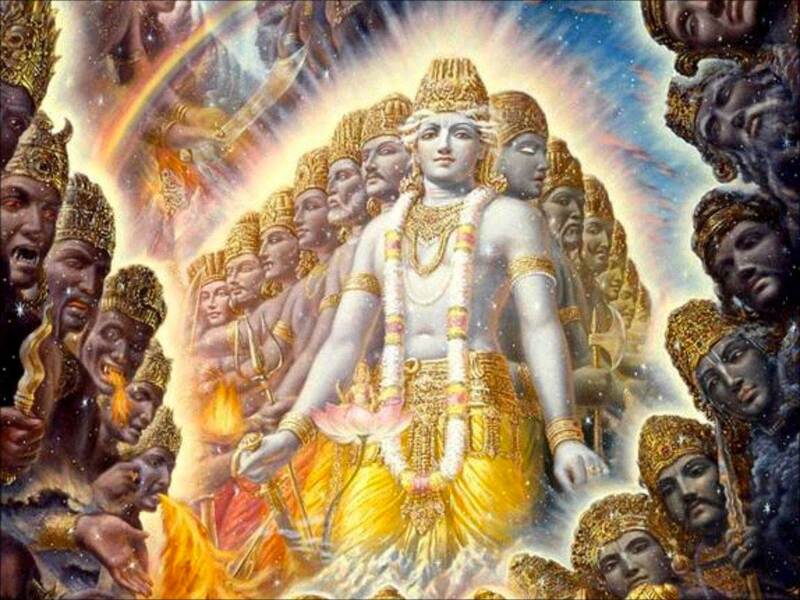 He manifest to Arjuna in myriad forms, it so overwhelmed Arjuna that he asked the Lord to come back to His form as Krishna, Dasha Avatar. It was too much for him. But we need to expand our consciousness. Who is God? What is God? How can I talk to God? How can I share my life with God? Going back to what I said at the beginning – simplify your life. Make time and make space for God in your lives. Elevate your consciousness to live in the consciousness of love. Get the shakti, the power, the Vel of the Lord, so that your lower nature is under control. So that your higher nature dominates. That shakti, that power will change your vibration, change your aura. Make it possible for the love of God that is within you to express itself. Don’t be frightened of expressing love to God. Be joyful in that act of worship. Be truly joyful. Yes, there are rituals and there are ways of doing things. But if you approach God with deep, deep love then God is your servant, God is your slave – because God is love. And it is as simple as that Divine friends. Approach God with love and sincerity and for sure, you will experience the grace of God in your lives. We are now going to offer petals to the Lord’s Vel, and we invite some of you, a few of you to come and join us in that. We’re going to bless the food that has been offered by you. Through love you’ve offered this food to the temple – the rice, the lentils, the milk, all of the things – the chickpeas which has been prepared. And that will be given as prasadam, because this food is Brahma – Brahma has provided this food. You are Brahma who is going to consume this food. And when we bless the food, we’re acknowledging that Brahma is everything. There is no separation. And when you bless food like that it becomes maha prasadam. It takes on a vibration. That is something simple you can do in your homes as a family. Very simply, offer food to God. It then transforms the vibration into maha prasadam. After we have chanted we will then take the Lord’s Vel back in procession for the final aarthi in the temple.